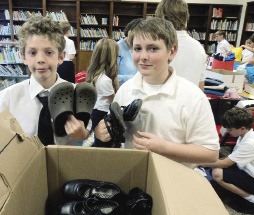 Students at St. Patrick’s School pack donated shoes to help tornado victims in Mississippi. When tornados touched down in Okolona, Miss., last spring, the small town was left in ruins. “It was a horrendous ordeal. They leveled everything. Destroyed homes. The whole town was in shock,” said Sr. Liz Brown, CSJ. Sr. Liz, a former principal in the Syracuse Diocese, is the executive director of EXCEL, Inc. in Okolona. She started the organization as an after-school program to meet the educational needs of the area’s children, but it has grown to also encompass support for all people in the low-income, rural community. She funds the program through proceeds from her thrift store, as well as individual donations. Sr. Liz knew her EXCEL clients needed help in the wake of the storms. Some families had nothing left but the clothes on their backs. So when her sister, Peg Brown, principal of St. Patrick’s School in Oneida, asked how she could help, Sr. Liz suggested a children’s clothing drive. Brown talked to the students about the devastating storms and asked them to put themselves in the shoes of the kids in Okolona. Many were concerned about whether the children had toys to play with. Brown said the response was sweet, but she wanted to make sure the students understood just how deeply Okolona had been affected. “I asked them, ‘What would it be like if you came home from school and had nothing but the uniform you’ve got on right now?’ You could see it sort of dawn on them,” she said. A note went home with the students, asking for donations of new basics, like underwear and socks, and gently worn clothing. Donations poured in. “I believe every family in the building brought in things,” she said. Hundreds of dollars in cash donations came in, too — sometimes in 25 cent increments. Students gave up their ice cream money. Even some loose change found on the playground went toward the cost of shipping the clothes. About 50 families were reached with donations from St. Patrick’s, an important step in helping the community to get back on its feet.